Take care of a hurt little unicorn and cure it so it can play with its friends again! 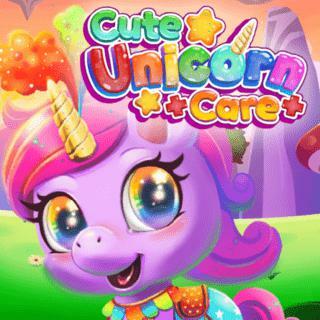 You can choose from three adorable creatures - simply select the unicorn you like best and start playing. Wash its coat and clean its horn and hooves with various tools. Then tend to the sick animal's wounds, give it medicine and feed it some healthy food so it can quickly recover its strength. Finally, you can dress up the magical pet for a costume party with its friends. Can you put together a cute outfit and impress the other animals? Welcome to our famobilicious HTML 5 cross-device game catalog. Here you can find more than 300 non-exclusive and exclusive licensed HTML5 games, reviewed, categorized and hand-picked for every taste. Feel free to browse through our games created by developers from all around the world. If you like Cute Unicorn Care games, you should check out the other games from our famobilicious game catalog. Do you need help? Why don't you check out our Help & Support category and see if your questions and problems can be solved.